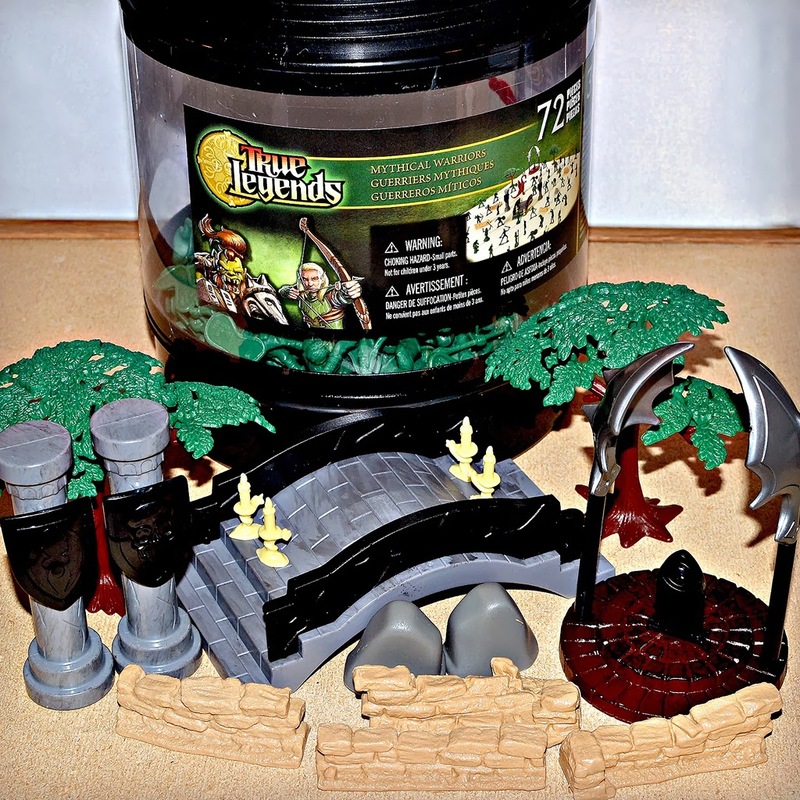 Little Weirdos: Mini figures and other monster toys: 'True Legends' Mythical Warriors: Bucket full o' fantasy figures! 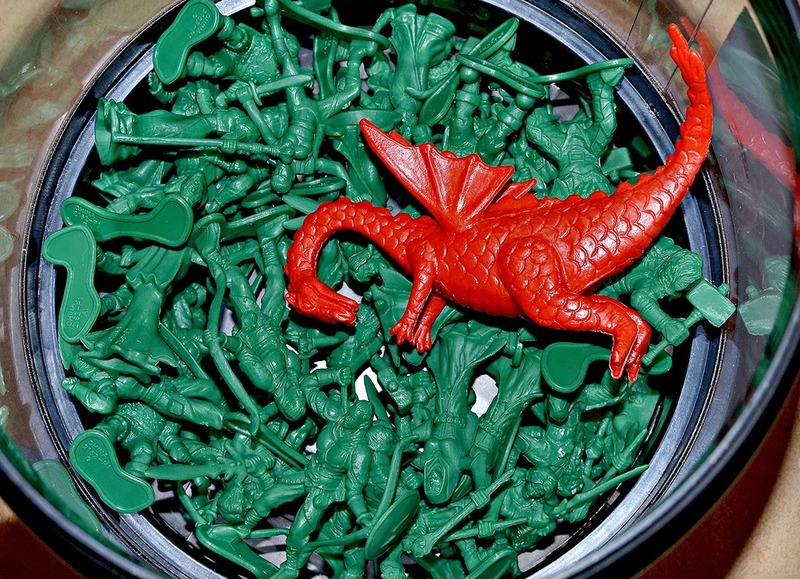 'True Legends' Mythical Warriors: Bucket full o' fantasy figures! If you've been to a Toys R Us store recently, you might have noticed an array of toys called "True Legends." This is a 2013 line exclusive to Toys R Us that features action figure sets of all different kinds of hero/warrior types, including Greek mythology characters, pirates, ninjas and more. I was pretty stoked to find out that in addition to the action figures, there are also buckets of mini figure playsets available under the True Legends name. One of these is a really cool set called "Mythical Warriors," which is reminiscent of the classic DFC fantasy playsets of the early 1980s as well as HeroQuest game pieces. 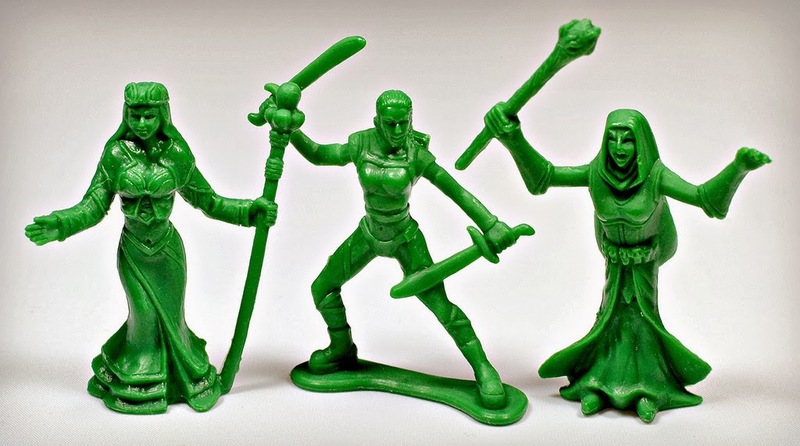 As you can see from the photos, the set consists mostly of plastic green "army men"-style mythical beings. These figures are 1.5 to 2 inches tall. 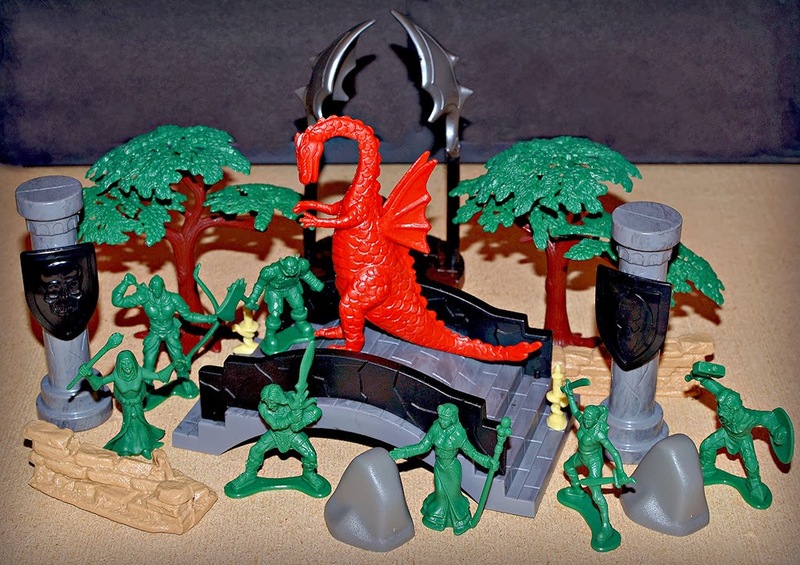 Also included is a larger red dragon (around 3.5 inches tall), and multiple playset pieces you can use to set the scene of the fantasy battle. In total, the bucket includes 72 pieces. Here are the first four participants in this epic mythical battle. All the way to the left is what I believe to be an orc. He doesn't look too monster-ish or crazy, but he has fangs, so he's got to be something other than human and orc sounds about right. Next to him is a Conan-esque barbarian. Then, we've got the tallest warrior, a Middle-Earth style elf ready for battle with his bow and arrow. Finally, there's a bulky bearded dude with a hammer and shield. He looks a bit too big to be a dwarf, so my best guess is he's supposed to be a berserker (if this were a role playing game, I'd totally pick him!). The set of seven warriors is completed with these three female figures. I have to give them credit for including three different female characters in this set. Usually with toys like these there's none, or one at most. The figure all the way to the left looks like some sort of magical queen or priestess. The one in the middle looks to be either an amazon or an elven warrior. Finally we have my favorite to the right, a nasty-looking cloaked witch or evil sorceress, complete with a belt made of skulls! And here's señor dragon. I'm not sure what his role's supposed to be in the fantasy battle. Are they all going up against him? Is he assisting one side? Or just an innocent dragon who found himself in the wrong place at the wrong time? He actually looks pretty friendly, as dragons go. In any case, I'm not complaining about his inclusion. I'm pretty sure I've seen this dragon figure (or a very similar sculpt) in one form or another in the past, but I can't pinpoint where. This one is made out of a somewhat softer, more flexible plastic than the other pieces in the set. 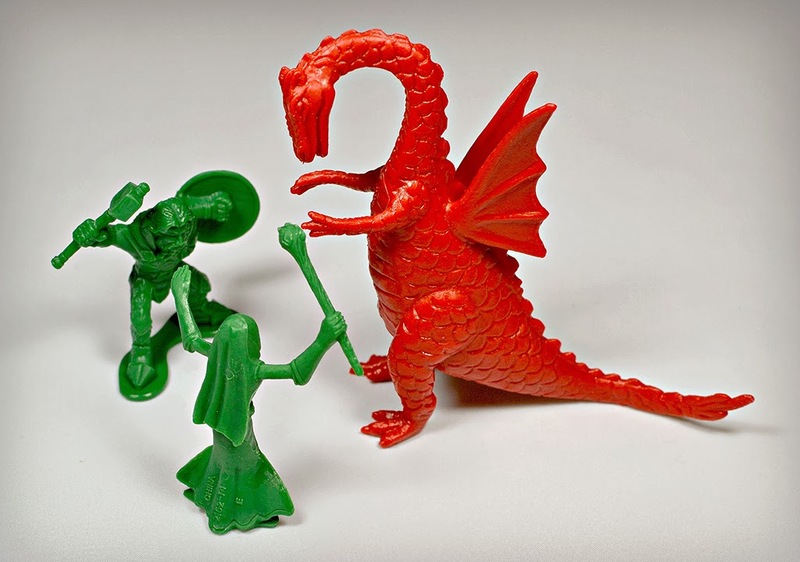 And there you go--a fantasy battle that makes for hours of fun. Or at least minutes. The True Legends Mythical Warriors set screams of '80s fantasy toy nostalgia, and I was really happy to find it. We need more stuff like this back on toy aisle shelves! Dude, this set rules! The accessories are really nice too! Usually the accessories that come with these kinds of sets are pretty dang awful, but these aren't bad at all. You could create your own tabletop game with these guys. I'm really tempted to run out to a Toys R Us and pick one of these up for Christmas. They'd play well with my Pirate Skeleton figures. Thanks for sharing! I figured you'd like them as much as I do! When I got them a couple days ago they were on sale for $7 a set. Not sure how long the sale was going to last, though. I think the regular price is around $10. I actually just ordered a set last week. I can't wait to get my hands on em. They had a buy 1 get one half off so I also picked up the pirates vs. skeletons bucket as well. I'm a little bummed to see there is only 1 orc sculpt. I thought there would be more. Nice! I think I also saw the pirate bucket there, but I didn't look at it close enough to realize there were skeletons in it. That automatically makes it a lot more interesting. Oooh I love these! Total nostalgia bomb! I think I need a set as well. Thanks for the heads-up! This set looks so cool! I'm based in Australia, so I will definitely be checking out my local TRU for these bad boys. Hope you can get a hold of one! I have plans to use them for a table-top battle type thing if I get time to work on it. Yeah, I was pleasantly surprised by how detailed they were. A great set overall. Haha, I can't remember if I got more archers or not. Only one problem..I got the bucket home and one of the tree's limbs had broken off..there pretty flimsy where the tree branch snaps on, I would suggest looking threw it making sure they arnt broken and dont shake it and pray no one else did..they should have never had the tree already assembled. whoa Anonymous guy is on to somthing! I didnt even realize, there are different amounts in each bucket, Heres what i got, please post yall's to get a better idea. I didn't even realize that when I got mine and opened them up. I'll have to go back and check how many of each I got. Found a set of these at a Sydney TRU yesterday for $10! Have been hoping they'd turn up over here ever since I saw this post -- so grateful it finally did! Cool, glad to hear they've gone international!